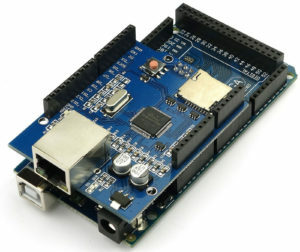 We are going to use an Arduino (any model) with an Ethernet shield. You can also perform the same task with WiFi shield with some minor changes in the code. Since I only have 1 Arduino at hand and no actual sensors, I am going to emulate the test scenario in the code. But You can of course change to code according to your needs. The important part of the code is how to write into the buffer and how to calculate exact length of the content so we can make the HTTP parser of InfluxDB happy! This can be done through the magic of sprintf function which can write into a buffer char array and return number of written bytes. Here is the code, I have comment it throughly so it should be obvious what it does. If you have any questions, feel free to ask in the comment section or in the embedonix’s forum. * @brief: Returns a place out of 4 places we have! //after tags, comes the values! Lines 4 to 16 are variables required for setting up and connecting to the server using the Ethernet shield. In my case, the Arduino was connected to my own laptop in a loop-back configuration, so the server address for InfluxDB would be obviously 192.168.0.1. If you are planning to connect your Arduino to a router or you are using WiFi, you must make sure to put the correct address in the eth_server variable! In line 20 we have defined an integer equal to 2048, which is the size of our buffer to write the insertion query in it. Line 23 is the definition and initialization of the buffer. So all and all, what you need to pay attention is the correct usage of writing a message into a character array buffer using sprintf function and using its return values to know where to continue inserting into the buffer. In the next step, we will see how does the data is being transmitted and how to see the raw data in the InfluxDB’s administration panel. Arduino, database, Grafana, InfluxDB, Measurement, Sensor, time series. Bookmark. but werirdly compile fine for arduino due ! I have only tested this with Due. I’m not sure what the problem could be as I don’t have any other arduinos to test again. I just guess it has something tido with your Ethernet library. Thank, I tought you were using a 2560 . Now compile Fine for 2560 , dont ask me more details !!!!! Just gave up, moved it all to arduino due, still having compilation error for 2560, but all working fine on due. Rest of instructions are all good. Thanks, I edited the problem on the last page. I do not know why the code is not woking on Mega since the code is pretty much standard C.
Hi. Code is working fine, I also needed to Optimize due to using a Mega. I am actually using a ENC28J60 with the UIPEthernet which is drop in for Ethernet.h however I dont get any respone from the server shown in Serial Monitor just the “Reply from InfluxDB”, The information is reaching influx it just doesnt display the 204 error it should in serial monitor. Dont suppose you have any pointers, not that its essential as the code is working. I think you should play around with the delay value between sending and waiting for the response. Give it a try. And perhaps you can show the changes you made to make it work on Mega? maybe that’s the problem. Jean-Francois Payeur comments show that it doesn’t work on Mega, although I have never tried it with Mega so can’t say for sure. Thanks for responding, great tutorial by the way. I followed Jean’s instructions as I got the same compile error an it was the GCC . Only difference in code compared with yours is i added this at the top of the skect. I managed to get it working by replacing availible with connected. Thanks for sharing your discoveries 😉 I think I have to reflect that in the article. It could be because I’m using the UIPEthernet library. I regret to inform the test I had running which was taking humidity readings from 3x DHT11 stopped sending information to influx after 60hours. Unsure on why it failed as it wasnt plugged into the computer so didnt have Serial Monitor open 🙁 I have reset the Arduino and hope for a better result, maybe it was my cat. Excellent tutorial! But im having a problem that a copple minutes after starts sending data, arduino cant send any more messages, it just cant connect. If i restart arduino, it works again. Any ideas? This might be due to bugs in original ethernet library of Arduino. Try to use a third party library and see if it helps. how can i post each field with multiple field value. batch data sent to influxdb. It is possible according to influxdb documentation, I do not know myself but I have seen it in their documents. Search for something like “sending multiple data in single query” or something similar on their documentation page. I found your code very useful, but the thing I do not see is how the data is written into your created database. I mean how do you tell the Arduino to send the data to the database named “embedonix”? In my case the data is being sent (at least the serial monitor says so) but if i check for the data, the databse appears blank. Please check to log file of influxdb (or run influxd in standalone mode to see std output) and see if you receive any http request or not. I planned to do this for my house but instead of Ethernet shield i’m gonna use esp8266 wifi module.So can i do some changes to your code and use it for my project?